Politicians must act to 'separate the real from the make-believe', Coalition for Reform in Political Advertising says. The Coalition for Reform in Political Advertising has launched a campaign demanding legislation to stop lies in political advertising. 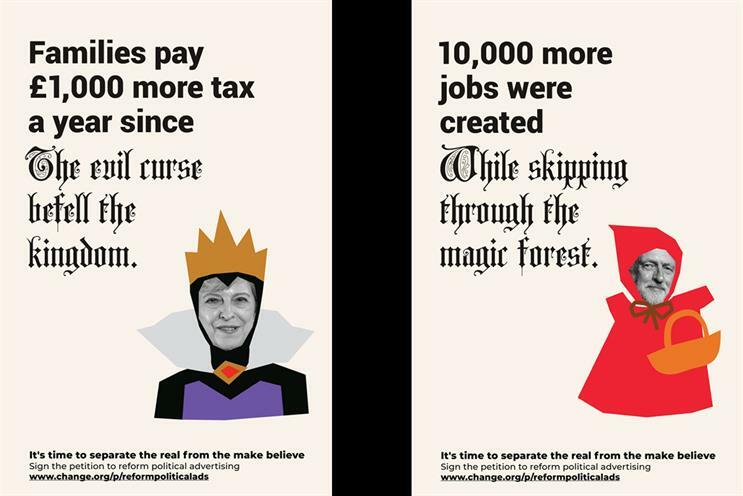 Created by AnalogFolk, which is a member of the coalition, the ads use language and iconography from fairy tales to make the point that fictional claims should have no place in political campaigning. They include the tagline: "It’s time to separate the real from the make believe." Running on social media, online and across outdoor sites, the executions encourage viewers to sign a petition at change.org/p/reformpoliticalads that demands legislative change. 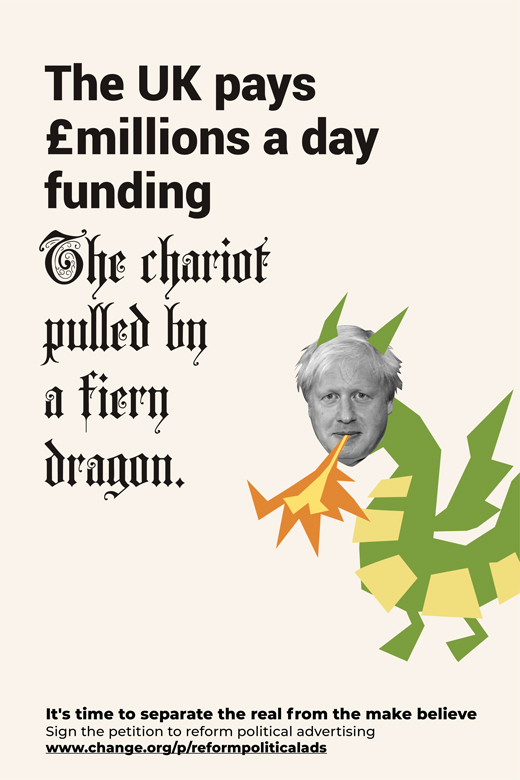 Ads include a poster of Theresa May looking like a pantomime villain, with the headline: "Families pay £1000 more tax a year since the evil curse befell the kingdom." The campaign aims to protect Britain ahead of a second referendum or snap general election. While there is currently no legislation preventing political advertising from making unsubstantiated claims, 84% of voters think there should be a legal requirement for factual claims in political advertisements to be accurate, according to a YouGov survey commissioned by the coalition and Full Fact. The Coalition for Reform in Political Advertising is a non-profit and cross-party initiative founded by Benedict Pringle and Alex Tait. Pringle has run the website politicaladvertising.co.uk for more than 10 years, while Tait has worked in marketing departments for companies including Unilever. Pringle said: "When false claims are made during election campaigns, it undermines the moral authority of the result and increases voters’ distrust in politics more generally." Tait added: "Lies from one political group muddies the waters for all of them (even the ones that tell the truth). Dishonest political advertising is damaging our democracy. It’s time for a change." Other members of the coalition include ISBA, The Internet Commission and Econsultancy. Phil Smith, director-general of ISBA, said the body supports the coalition's four-point plan and believes "there is urgency for there to be agreement in how political advertising should be more closely regulated ahead of any potential upcoming electoral processes".